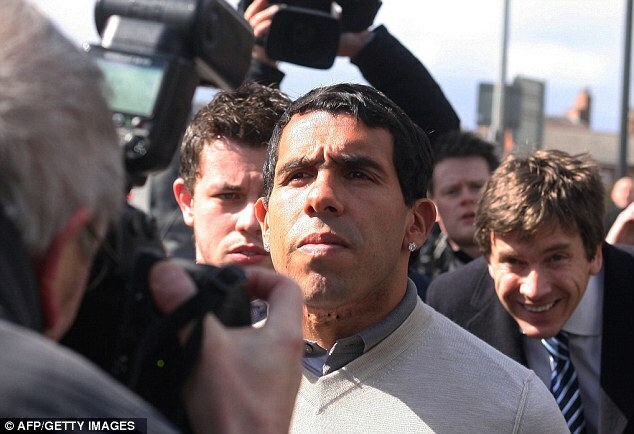 Manchester City striker, Carlos Tevez escaped a prison sentence today after pleading guilty to driving while disqualified and without insurance. The Argentina forward faced up to six months in jail but was instead ordered to serve 250 hours of community service by Macclesfield Magistrates' Court. The 29-year-old, who earns £196,000-a-week, was also told to pay a total of £1,145 and banned from driving for another six months. The court heard that Tevez was stopped by police near his Cheshire home last month after they were given an anonymous tip-off that his car was parked at Mottram Hall Golf Club. He arrived in court wearing casual trousers and an open-neck shirt under a cream sweater and stood alone behind a glass partition. Speaking through an interpreter, he pleaded guilty to the charges after confirming his full name – Carlos Alberto Tevez – date of birth and address. The prosecuting solicitor Kate Marchuk described how police were tipped off that a white Range Rover allegedly belonging to Tevez was parked at the golf club. In fact, he climbed into a white Porsche Cayenne and drove off. Mrs Marchuk said: 'There had been a call from an anonymous caller that the defender had driven a white Range Rover to Mottram Hall Golf Club while disqualified. The police officer confirmed this on the computer, Mr Tevez having been disqualified. 'There was a white Range Rover on the car park but Mr Tevez did not get into that car. There was however a white Porsche Cayenne parked in the car park and a check on the international computer showed it to be registered to the defendant. 'Just after 5pm that afternoon Mr Tevez went to the vehicle, got into the driver's seat and drove off. The police officer followed him as he turned onto Wilmslow Road and then Priest Lane. 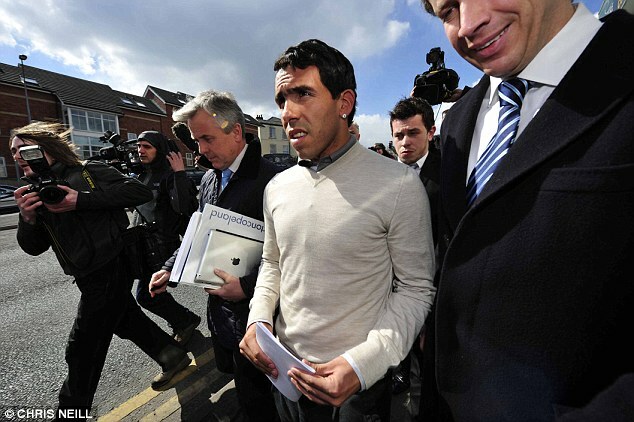 Tevez had already been banned from driving for six months and fined £1,540 after failing to persuade Manchester Magistrates' Court that he did not respond to police requests for information relating to two speeding offences involving cars registered to him because he did not understand the word 'constabulary' on their letters. He was represented by Gwyn Lewis, the solicitor dubbed 'Merlin the Magician' because of his impressive track record of making cases disappear. Mr Lewis argued that Tevez was actually two thirds of the way through the ban because it had originally been imposed by Lancaster magistrates in November, and that this was the first time he had been before the court where he was directly responsible for the offence. He also claimed that Tevez had actually stopped driving before that because he did not have a UK driving licence, mainly due to language problems passing the theory test. 'The whole experience from being arrested to being in the police station to being in court is all completely alien to him and very frightening,' added Mr Lewis. 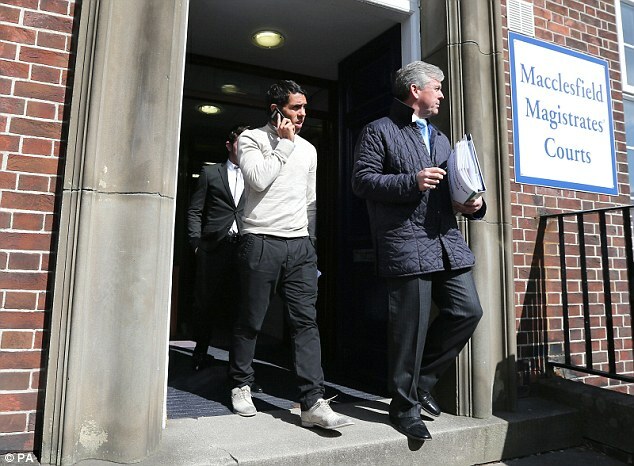 Before the magistrates decided on the verdict, Tevez left the courtroom to conduct a 15-minute interview with probation office Mike Boliver who concluded that the player was truly sorry and that a community service order was the most appropriate punishment. 'He was very clear when talking to me that this has been a salutory lesson,' said Mr Boliver. 'The likelihood of this happening again is highly unlikely. Today's hearing at Macclesfield Magistrates, chaired by Mrs Elizabeth Depares, agreed with Tevez's solicitor that is was a 'mid-range offence' more deserving of community service than a custodial sentence. Announcing the verdict, Mrs Depares said: 'Mr Tevez you must realise that you a role model for thousands if not millions of fans. Nobody is above the law and you should not have been driving. 'We have heard that you are sorry and it is now up to you to ensure that you will not be brought back to court again. Tevez must serve 250 hours of community service within the next 12 months, although it is unclear what would happen if he was to be sold by City to a foreign club this summer. He was also told to pay a victim of surcharge of £60. The Argentina striker, who was told the punishment would have been more severe had he not pleaded guilty, also agreed to supply his own interpreter while carrying out the unpaid work. For the offence of driving without insurance, he was fined £1,000, banned for a further six months from today and told to pay costs of £85. He has seven days to pay. Tevez's case was slated as No 7 on the court list but was actually the second heard after the magistrates convened at 10am today. He was the second Premier League footballer to appear at Macclesfield Magistrates' Court charged with this offence in the last few weeks. Everton's Slovakian goalkeeper Jan Mucha was ordered to serve 250 hours of community service last month after claiming he did not realise he was disqualified because he did not read his own post.